Harmonia friends, come celebrate with us! Season highlights include the appointment of our new Music Director, Norm Zogaib, and the guest residency of Stacey V. Gibbs, composer and conductor, in March. Harmonia will perform several thrilling works this evening, specially prepared for our guests. Join us for a beautiful event at one of Western New York’s finest restaurants. No tickets will be mailed. There will be a guest list at the door. Please consider a financial contribution in order to ensure our future. Harmonia is a not-for-profit 501(c)(3) tax-exempt organization, so your donation is tax deductible! 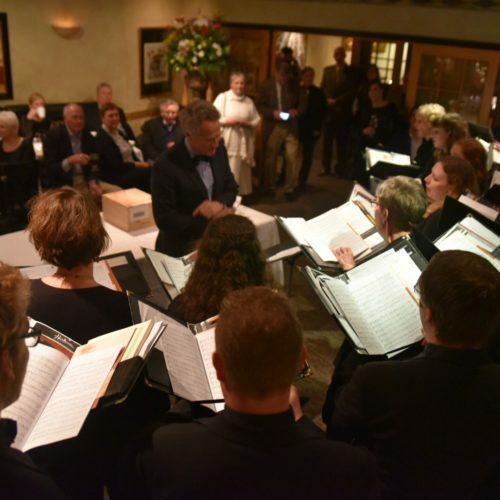 Dinner, drinks, gift basket auctions, and music, all to benefit Harmonia’s 2018-2019 Season. New Music Director Norm Zogaib will conduct several thrilling works to be presented only this evening. Join us for a beautiful event at one of Western New York’s finest restaurants.